On this, the last day of 2012, I’d like to present the culmination of all my movie watching for an entire year. I’d also like to take this opportunity and thank you for reading my blog. I’ve appreciated each and every one of your comments. You are the reason I enjoy running this site. Without you, I’d just be talking to myself and that would make me crazy — or crazier at least. Wishing you all a happy and prosperous New Year!! 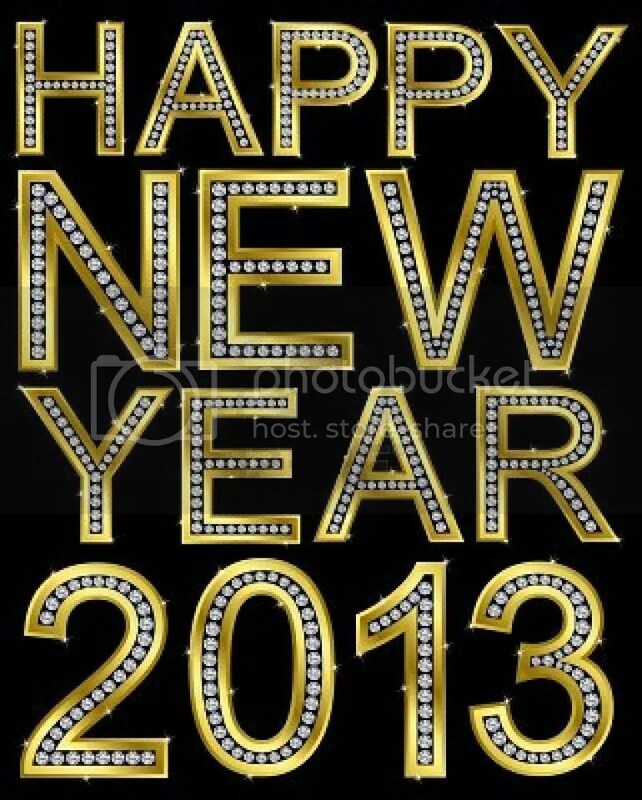 Hope 2013 is your best year ever! Les Misérables is an achievement, the cinematic realization that fans have waited almost 3 decades. The stage musical is a global sensation. It opened in London on October 1985 and has run continuously since. The Broadway rendition debuted 2 years after the West End debut and became the fourth longest-running show in U.S. history. The road from stage to screen has been a long journey with a storied development beginning in the late 1980s. It’s safe to say expectations were very high. Under the direction of Tom Hooper, the production is realized as a thrilling success, with minor caveats. It is the story of Jean Valjean, a peasant who serves 19 years in jail for having stolen a loaf of bread for his starving family. He’s prisoner 24601! With the blessing of a sympathetic Bishop, Valjean breaks parole to start a new life as an honest man. He makes good on his promise and becomes a benevolent factory owner and mayor full of kindness and understanding. Unfortunately he is still relentlessly pursued by police inspector Javert who is beholden to the law. We’re also introduced to a large company of various individuals all set against the backdrop of the French Revolution . In any drama with a large ensemble, there is a danger that the production can become cumbersome or scattered as more individuals begin to pop up. What impresses is that director Tom Hooper deftly handles the large ensemble of actors giving us an intimacy with each one that benefits their character and our sentimental attachment to each story. He makes the questionable decision to film the singing live ostensibly to make the story’s emotional component more of the moment. There’s definitely an immediacy to the proceedings, but at times the vocals suffer. The time-honored movie musicals have always relied on the perfect take. As this is a movie musical and not being performed on stage, why not take advantage of that fact. Wouldn’t it have been smarter to studio record and enhance the clarity of the vocals? Nothing against Anne Hathaway’s stunning portrayal of Fantine, but when she’s sobbing uncontrollably all throughout the famous number, ‘I Dreamed a Dream’ it really is a bit of a buzzkill. I usually tear up every time I hear that majestic song with it’s high notes and sweeping strings. Yet when she sang it, I didn’t. As a performance she’s incredible, however. And speaking of performances, Hugh Jackman is quite simply extraordinary. Rarely have I seen an actor combine the vocal chops with acting ability to create a moving achievement that is among the most accomplished in film musical history. What’s so extraordinary is that he finds a vibrancy that immediately draws you into his story as if you’ve known him all your life. Russell Crowe isn’t anywhere close to his match as Javert, his nemesis, but he does provide a counterpoint to Jean Valjean. I’ve seen the play twice performed on the stage, in 1990 and again this year 2012. I understood Crowe’s character arc better in this production than I ever have before. What he lacks in vocal strength, he more than makes up for in raw emotion. They’re skillfully energized by a strong supporting cast. There’s much too many parts to detail individually, but I should mention Helena Bonham Carter and Sacha Baron Cohen who provide wonderful comic relief as corrupt innkeepers The Thenardiers. Aaron Tveit as Enjolras, the student revolutionary, whose vocals are just as powerful as they need to me. And I most assuredly must highlight Eddie Redmayne as Marius and Samantha Barks as Éponine. Éponine’s unrequited love for Marius is surprisingly one of the narrative’s most affecting moments. Her song ‘On My Own’ was a floodgate of emotion for me. The ‘In My Life/A Heart Full Of Love’ is another high point, both of them singing along with Amanda Seyfried as Cosette, the harmony of their voices overlapping like some heavenly trio. Their hymn, one of love discovered, the other of love lost, is heartbreaking. Les Misérables isn’t perfect, but it’s an absolute joy to anyone who’s a fan of Hollywood cinema on a lofty scale. And why shouldn’t it be grand? The chronicle is based on the 1862 novel by Victor Hugo. Perhaps because it feels as if the musical has always been with us, it’s difficult to imagine a time when adapting the somber tome of French literature into a musical was actually a radical concept. 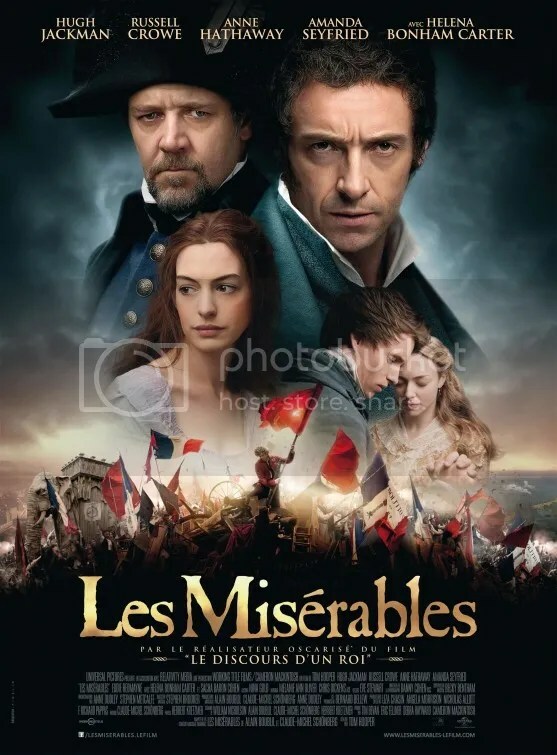 This is rather depressing stuff but in the hands of director Tom Hooper, it is an emotionally involving, monumental saga in the timeless tradition of classic movie musicals. The story is sweeping, the vocals are (mostly) impressive and the lavish production is a marvel – the kind Hollywood was known for in the 40s and 50s. I love that this version made me see things I never noticed before. Les Misérables is paean to the beauty and romance of Victor Hugo’s well known French tale and indeed of grand filmmaking at its most epic. Alexander Diminiano of Cinemaniac Reviews recently interviewed me for his site. I must give him kudos for being one of the most ardent supporters of my personal blog. His comments are always such a joy to read. This was a fun interview. He asked some really good questions. Check it out! This interview was conducted between November 26th and November 30th. A Chinese street gang, the Lords of Death, have kidnapped Wang Chi’s green eyed fiancée. That’s the “big trouble”. The “little China” is San Francisco’s Chinatown where she’s taken. John Carpenter’s amalgamation of action / adventure / comedy / fantasy is a loving, send up of a martial arts films. John Carpenter directs frequent collaborator Kurt Russell in their 4th partnership together following Elvis (1979 TV Movie), Escape from New York (1981) and The Thing (1982). Kurt Russell is clearly playing it for laughs channeling a screwy version of John Wayne. It’s a performance rooted firmly in camp. “I’m a reasonable guy, but I’ve just experienced some very unreasonable things,“ he says at one point. In fact he’s frequently prone to casting witty one liners that sound more like catchphrases than actual dialogue. And that’s just fine because the whole production is ridiculously over the top. Big Trouble in Little China is focused on a colorful cast of characters. Where else can you go toe to toe with a villain that will blind you by staring into his glowing eyes or the energy blasts from his mouth? Those powers are embodied in evil sorcerer Lo Pan memorably played by James Hong. He’s flanked by The Three Storms (Rain, Thunder and Lightning) lesser sorcerers who look like they’re wearing huge lamp shades on their heads. Their first appearance is a wonderful showdown that combines two warring gangs: the Wing Kong, commanded by Lo Pan and the Chang Sings (the “good” guys). I’ve never seen or heard so many thunderclaps and animated lightning bolts discharging from people’s hands. And I would be remiss if I didn’t mention those bizarre creatures. Words cannot accurately describe one I’ll simply call the Floating Eyeball Monster. It must be seen to be truly appreciated. Jack Burton: Somebody tell me what is going on! 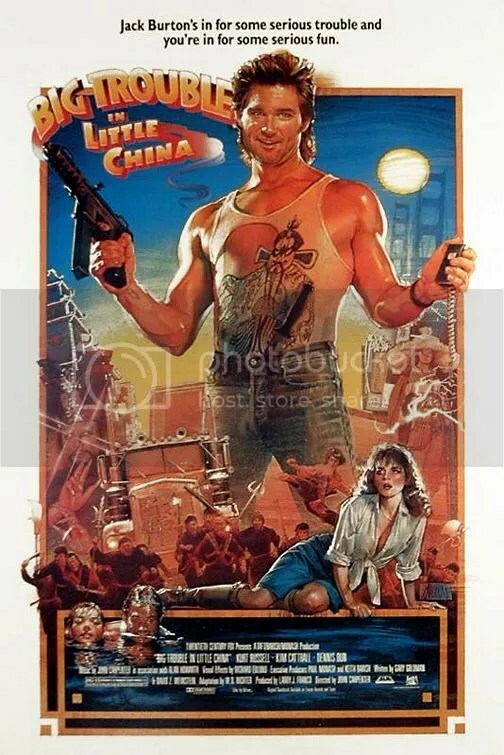 Jack Burton: I can take it. Wang Chi: We don’t know. On December 26, 2004 a tsunami occurred in the Indian Ocean as a result of an earthquake off the west coast of Sumatra, Indonesia. The tragedy was responsible for the deaths of over 230,000 people in fourteen countries. It was one of the deadliest natural disasters in recorded history. Indonesia was the hardest-hit, followed by Sri Lanka, India, and Thailand. Those are facts, but they certainly don’t have the sentimental impact of the personal story. 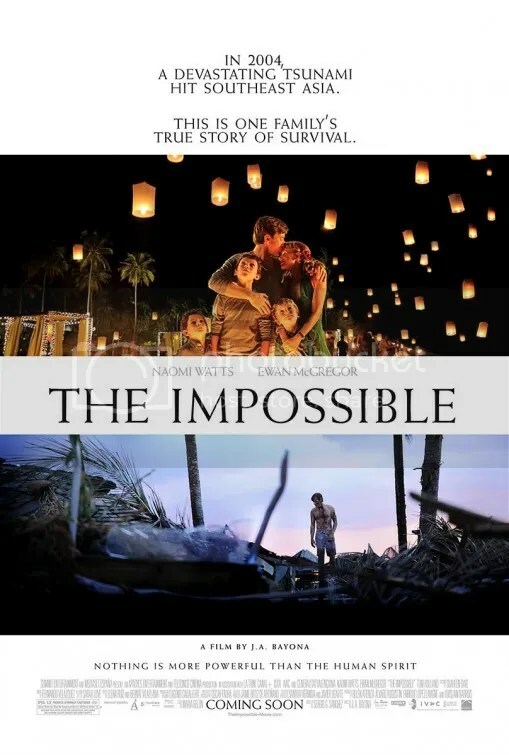 The Impossible is based on the actual chronicle of a Spanish family’s struggle while on Christmas vacation in Thailand at a tropical paradise resort. This then is the story of the subsequent terror from the standpoint of a British couple, Maria and Henry, played by Naomi Watts and Ewan McGregor, and their three children. They become separated and this account details their arduous journey to reunite. At the outset what impresses is the sheer spectacle in the epic depiction of the tsunami. Apocalyptic is the only way to accurately describe the utter severity of the catastrophe. We’ve seen natural disasters at the cinema over the last two decades: Twister (1996), Armageddon (1998), The Perfect Storm (2000), The Day After Tomorrow (2004). While those flicks were entertaining, they don’t even come close to the depth contained within this convincing tale. Perhaps that’s partially because The Impossible recounts a true story that millions, myself included, saw unfold on TV. Those images are hard to shake and visually this does a brilliant job in recreating the absolute magnitude of the chaos. It’s the extraordinary performances that’s separate this from other memorable disaster films. An authentic recreation of a calamity, however accomplished, wouldn’t have been enough to sustain a movie. Ewan McGregor as father Henry, Tom Holland as his oldest son Lucas and most notably Naomi Watts as Maria, his wife, are the heart of this picture. This is a story that wisely focuses on the drama of human feeling. It is largely unconcerned with collective depictions of horrendous misfortune in the various countries affected or sweeping news reports from around the world. The script is concerned with the exclusive perspective of a small group of people, This depicts what an individual would experience – both the physical and emotional effects. The situation is devastatingly real. It’s very easy to imagine yourself in their shoes. There are times where I was overcome with grief. Sometimes in seemingly trivial actions where it’s difficult to explain why it moved me so. At one point, a rescued toddler gently brushes the arm of Maria as sort of an unspoken gesture of gratitude. I can’t explain why, but I actually teared up at the expression. There are many moments like that throughout. The Impossible takes the adversity of the 2004 Indian Ocean tsunami and wrings genuine emotion from the events. I’ll admit there are a couple instances where I did feel a little manipulated. Do we really need Fernando Velázquez’s score to swell so loudly in scenes where the human drama speaks for itself? But that’s a minor quibble. Overall this is a heartbreaking take on a real life event from the intimate point of view of one family. Director Juan Antonio Bayona manages to tell their story without it ever being gratuitous or resorting to sensationalism. Credit should go to a trio of thespians: Ewan McGregor, young actor Tom Holland and Naomi Watts. Much of the understanding in their roles is hidden in what they don’t say – a look, a reaction, a smile. It’s difficult to convey that kind of expression well. They handle their respective parts with dexterity. Watts gives an especially impressive performance. There is not one false note in her portrayal. Her sincerity, along with her co-stars, strengthen an already powerful film. 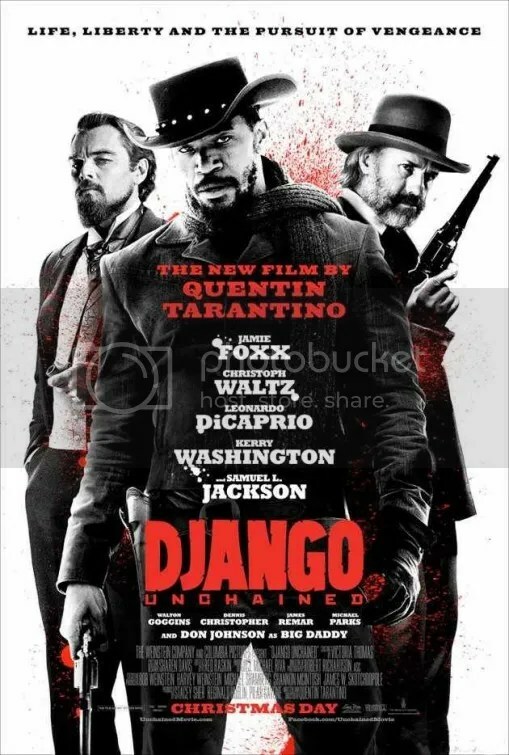 Note: This movie is being shown in select theaters at High Frame Rate 3D which at 48 frames per second supposedly offers a much sharper image. Since (A) I happened to see the film in 24 FPS, the cinema standard for over a century, (B) the vast majority of theaters are showing it in 24 fps anyway, and (C) such discussions have no bearing on whether it’s a good film, this is the only time I feel required to mention it. J. R. R. Tolkien’s classic of children’s literature gets a luxurious treatment in Peter Jackson’s reverent retelling of the 1937 fantasy. Overall it’s a stunning execution of the magical text of Tolkien’s words come to life. It’s an extraordinary rendering full of exciting set pieces, gorgeous tableaus and a fervently involving purpose. If there’s a criticism I can lobby toward this beautifully realized achievement is that perhaps it’s too much of a good thing. I mean J. R. R. Tolkien’s source novel was a relatively brief 310 page children’s book. This is only part 1 of a proposed 3 part series and it’s still almost 3 hours. Our fable takes forever to get started. The chronicle starts out with Bilbo Baggins, a hobbit, telling a tale in voiceover to his son Frodo. It’s a ponderous intro that recounts the dragon Smaug’s takeover of Erebor – “the Lonely Mountain”. This is the dwarves’ ancestral homeland, where they once lived, and sets up the purpose of the subsequent journey. Our proper saga rightfully begins when Bilbo reflects on the day he was first visited by the wizard Gandalf 60 years ago. 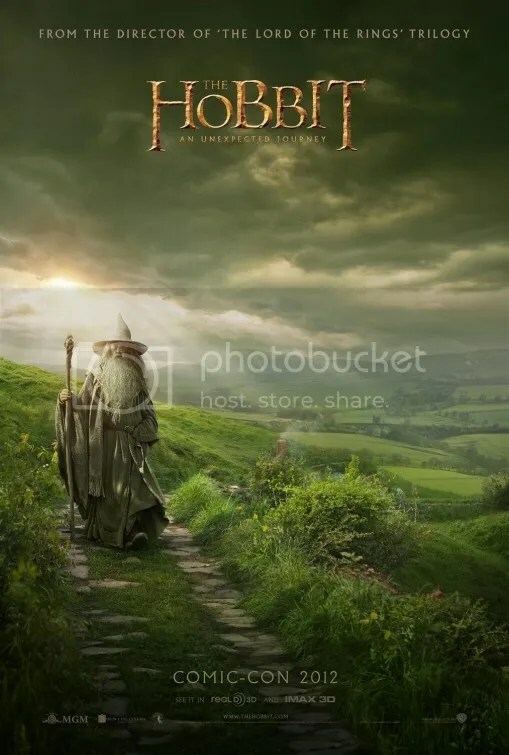 Gandalf invites a collection of dwarves to Bilbo’s home in anticipation of an adventure to re-claim the dwarves’ homeland and treasure from the dragon. This introduction to the various dwarves including Thorin, their leader, takes up an iodinate amount of time that seems to serve no other purpose than to pad an already slight plot and ultimately create 3 movies to charge admission to instead of one. Once we get past the worrisome opening, the tale takes root. Peter Jackson does a nice job of elaborating on details to flesh out the script. In one explanatory scene, Gandalf meets with a 3 person council to gain approval for their quest. All three interrogate Gandalf. The discussion gives commentary that not everyone approves of their quest. It’s an interesting footnote. While the company travels, they are constantly pursued by grotesque henchmen called Orcs that are riding Wargs, their wolf-like beasts. Peter Jackson highlights this constant threat as an underlying effective source of dread. There is a magnification of the character Thorin who is the main dwarf that wants to take back his grandfather’s kingdom. He becomes a co-protagonist of sorts. Bilbo’s introduction to Gollum is, as expected, mesmerizing and their interaction is a highpoint of the later half. Peter Jackson also does a great job at rendering visionary passages from the book into a physical manifestation before our eyes. In one thrilling episode, a storm in the mountains turns out to be not an actual storm, but giant mountain creatures hurdling rocks at each other. As the giants fight, the company becomes separated and the sight of the two factions resting on the crevices of these large stone monsters, accents one of the most exhilarating sequences of The Hobbit. This is a perfect example how modern technology can be artistically employed to dramatize complex sequences from books. It’s like a roller coaster ride. The movie does a nice job of fleshing out the fundamentals of J. R. R. Tolkien’s world and giving a context for The Lord of the Rings that follows. There is real drama in this motley group of 13 dwarves, one wizard and a very anxious hobbit. Much of the story is more than just a mere quest to get back the dwarves’ treasure, it’s also the introspective trek of one hobbit. His personal journey of self discovery is a sensitive arc that captured me throughout the film. Right from the beginning when Gandalf chooses him, Bilbo claims he’s not the hobbit Gandalf’s looking for. His ultimate willingness to leave the comfort of his home and face his fears of the unknown, make him a most likeable and sympathetic individual. We see a complacent homebody slowly showing the genesis of someone embracing courage within themselves. His changing status in the eyes of Thorin is an emotionally affecting storyline as well. Granted the plot stumbles initially with two unnecessary prologues that drag on the simple narrative. However once the expedition gets underway, it moves at a brisk pace and is consistently entertaining. This is an expedition worth taking. If I were to observe an open heart surgery as a series of procedures sans narration, I might at various moments throughout the process be repulsed, then fascinated. I’d have no idea what would come next and so I would be compelled to keep watching from a curiosity standpoint – spellbound by the procedure in its unfettered access. Then when it was all over and the body had been sewn back up, perhaps I’d remark that it was fascinating. But there would be no drama to engage my emotions. It certainly wouldn’t qualify as a movie with a plot. Just an array of maneuvers connected together by a common operation. Such is the experience of Holy Motors. Holy Motors is one of those unconventional fantasies that Luis Buñuel or Federico Fellini or David Lynch might direct. Except those directors usually have *ahem* a discernable point. Basically this is a accumulation of sketches strung together that tells the story of Monsieur Oscar who travels to miscellaneous meetings in the back of his white stretch limo. Before exiting his vehicle, he dons assorted disguises for each one. There’s some exposition in the beginning that implies he’s an actor being watched by an audience. The cameras are invisible, an offhand remark informs us. For each assignment, he dons a different costume as these mini movies recall various genres: a melodrama, a gangster flick, a musical, etc. 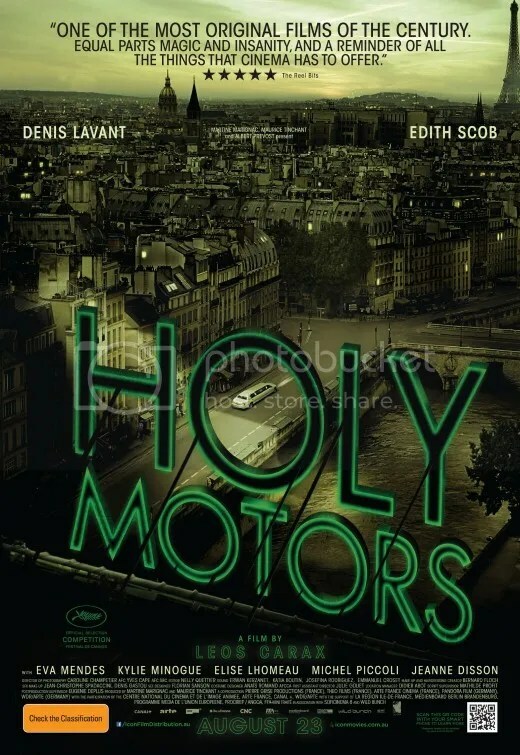 Holy Motors is a series of visual short cuts. The most memorable of these vignettes is a rumination on the fairy tale, Beauty & the Beast. French director Leos Carax has only made 5 features (and a few shorts) since 1984. As an elaboration of his own segment from the cinematic triptych Tokyo! Lavant plays a monster named Monsieur Merde (even non-French speakers understand that word). He’s a red haired and bearded creature that recalls a satyr from Greek mythology. Here he kidnaps a beautiful model (Eva Mendez) on a fashion shoot, from Père Lachaise Cemetery and absconds with her deep within the catacombs of Paris. What happens next is sort of symptomatic of every tale. We’re captivated with what might take place, then led through each story simply to find it goes nowhere. Each narrative starts out with promise and then deteriorates into a non ending. This one is particularly sad as it is desperate to shock. It ends stirring feelings of embarrassment by the viewer for actress Eva Mendes. How did she get roped into this? I wanted to rescue her from the ugliness. Much has been written on Holy Motors as this hard to classify, visionary art piece, but it really doesn’t seem all that innovative unless you consider stringing a collection of short films together a radical concept. Holy Motors contains little that is pretty or joyful. Leos Carax directs his frequent alter-ego, actor Denis Lavant. The 51-year old French star reluctantly journeys from appointment to appointment with nary a smile. He wears disguises with an unemotional professionalism not because he wants to, but because he has to. In a succession of vignettes, Monsieur Oscar assumes 11 characters including a beggar woman, an alien by way of a motion capture suit, a lecherous monster, a disappointed dad, an accordionist, an assassin, a dying man, and a former paramour in a perplexing bit in which pop star Kylie Minogue sings. Even her song is joyless. Lavant plays a mostly misanthropic bloke in each piece. He’s rather unlovable and kind of repulsive. Slowly over time we grow sorry for this individual. If we are to presume that Holy Motors is a movie about the making of movies, then I can only deduce director Leos Carax’s viewpoint is that they’re a drudgery to perform. While some have championed the images as a celebration of film. I see it more as a wake. 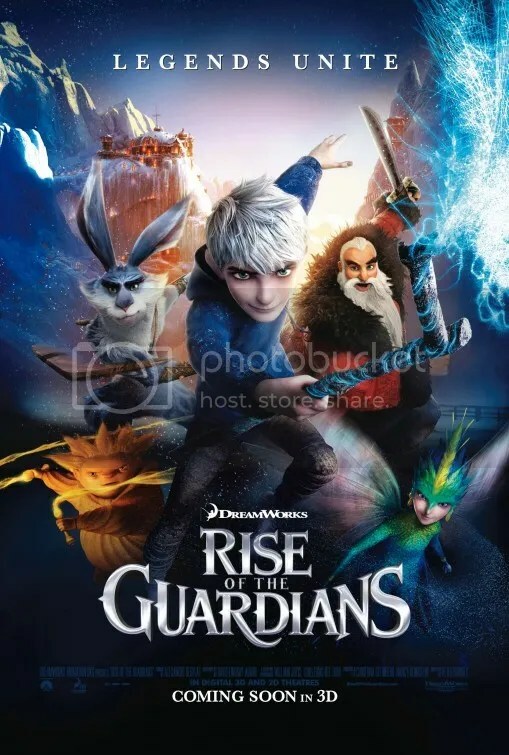 Rise of the Guardians involves four characters from fairy tales: Santa Claus, the Tooth Fairy, the Easter Bunny, and the Sandman who appeal to Jack Frost to stop the Boogeyman from engulfing the world in darkness. It’s kind of a pan-holiday movie that takes place in the days leading up to Easter. It specifically concerns whether children still believe in these individuals. Anyone concerned that they might actually be confronted with something vaguely religious given, you know, the themes of faith in a higher power that this deals with, need not worry. The script has been purged of God or anything remotely theological. We do get the mysterious moon as sort of this inanimate object, however who has chosen Jack Frost to be a new Guardian. They each look to it for direction and guidance, the moon that is. Jack also wrestles with his greatest fear – that children won’t believe in him. Gee whiz. Self obsessed much? I think the biggest problem with the Rise of the Guardians is that it flounders from a storytelling perspective. The plot throws these four fictional people together because, hey why not? One would’ve been enough, but four makes the narrative needlessly complex and overstuffed with backstories. There is no sense or charm to these oddballs. They’re recognizable portrayals, but then they aren’t. Jack Frost, our main protagonist, is a whiny teen consumed by the fear that people don’t affirm his existence. He sports a hoody and sounds like one of the kids on Wizards of Waverly Place. Santa has a Russian accent and is built like a bodybuilder with “naughty” and “nice” tattoos on his forearms. Huh? The tooth fairy flits around hummingbird-style, but talks akin to some over-enthusiastic mom. The Easter Bunny is a six-foot-one Australian and master of Tai Chi, as he’s quick to explain. Doesn’t seem to be helping because he’s a rather cantankerous fellow at that. Then there’s the Sandman. He was actually my favorite. He doesn’t speak at all. Rise of the Guardians fails as an interesting story. Characters pop up at random times, do their thing then disappear. There isn’t any rhyme or reason to this mess. The dialogue is full of bland pronouncements that are so boring they don’t even register: “It is our job to protect the children of the world. For as long as they believe in us, we will guard them with our lives,” says Santa at one point. Zzzzzzzz. “Why me?” Jack asks when they select him. “You have something special inside. I can feel it… ” says Santa. That’s about as deep as it gets. There’s some breathtaking visuals to be sure and there are a few chuckles here and there, but the action is way too cluttered and frantic to truly appreciate the animated details. There’s lots of dazzling displays that the latest 3-D computer technology can muster, but it does nothing for the story other than to show how much money DreamWorks has to spend. I’ve always been a fan of Disney’s Sleeping Beauty. Pitch Black, the Boogeyman, kind of recalls a male version of Maleficent, the evil sorceress from that film (and the best Disney villain ever incidentally). I was really rooting for him in fact. There’s even a climatic battle featuring a sand glitter vs. black dust face-off between the Boogeyman and the Sandman. It was pretty at least.